Some of you might be thinking that it is such a simple topic just because they have studied it earlier but this article is for those who find this topic tedious and time taking. 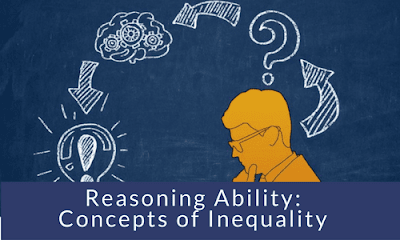 If you take extra time to solve the inequality question then you surely need to read this article. A concept already told by many but today we will not only learn it but we will work together. If you find all the three symbols or either two of them choose according to priority. Reason- when there is head on collision between (> and <) or (≥ and ≤) then the conclusion is wrong. Here we have > and < at the same time so conclusion A > E will be incorrect. The symbol should be (< & =) or (> & =) or (< & ≥) or (> or ≤). If none of the above rules applies then the answer is neither nor. Let’s work together. Try to solve the questions, first some simple one to understand the concept and then some typical one. (3) If either conclusion I or conclusion II is true. (4) If neither conclusion I nor conclusion II is true. Answer (1): If only conclusion I is true. Answer (4): If neither conclusion I nor conclusion II is true. Answer (2): If only conclusion II is true. Ques 1. Which of the following expressions will be true if the given expression ‘A > B ≥ C < D < E’ is definitely true? Ques 2. In which of the following expressions will the expressions ‘D ≥ B’ as well as ‘C > F’ be definitely true? Ques 3. Which of the following symbols should be placed in the blank spaces respectively (in the same order from left to right) in order to complete the given expression in such a manner that makes the expressions ‘B > N’ as well as ‘D ≤ L’ definitely true? Ques 4. In which of the following expressions will the expression ‘P > S’ be definitely false? answer 3 will be option 4.